Focused on the Far East, Perfect Destinations have been the go-to travel operator for those looking for an end-to-end solution for their travel plans. They provide expert advisors, tailor-made itineraries designed to suit individual requirements and direct relationships with their suppliers from budget to luxury accommodation and travel. They are passionate and knowledgeable about travel and the destinations that they specialise in and are highly professional and knowledgeable in their field. ViaData had previously worked with Go2Africa, another travel operator, and developed systems to manage multiple enquiries and maintain contact with their customers throughout their holiday. ViaData realised there was a huge functional gap in the travel and tour operator market for a system that could do this for all tour operators and travel companies. This functional gap was to manage the relationship with the customer (particularly their expectations, desires, frustrations and constantly varying requirements) whilst preparing travel/tour packages for them, which can be time-consuming, and then maintain a consistent, contactable, reliable relationship with the customer, from the time of initial contact to the time the traveller had completed their travels. “Travelyst makes the process so quick and streamlined for us” – Shona Pittaway, Managing Director, Perfect Destinations. ViaData commissioned a market research company to confirm the size of the potential market with this type of business issue. The size of the problem in the market was subsequently confirmed. However, we also realised that any system we developed to maintain customer relationships also needed to flow seamlessly into a booking system, itinerary builder and back-office accounting system, to create an end-to-end travel business solution. We noted that standard Customer Relationship Management (CRM) software does not have a travel/tour operator component, and existing tour operator systems were more focused on bookings, invoicing and accounting than on traditional CRM activities. We would have to build our own travel-focused integrated CRM system. Perfect Destinations were a small tour operator that had successfully focused on a niche and were looking to grow their business. They wanted to be efficient and client focused and build upon their culture and reputation for excellent service to their customers. 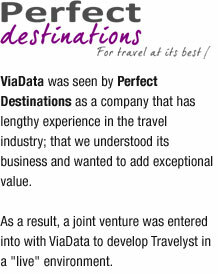 Perfect Destinations and ViaData agreed to work together to create the new customer focused system. Perfect Destinations would receive a custom deeply travel-focused CRM and booking system exactly tailored to their needs and ViaData would own the Intellectual Property for the resulting system which would be developed from scratch as a product with wide scale travel industry applicability. “Wow!! The flights add-on is absolutely magic, and it’s going to make a massive difference for us, really outstanding, thank you so very much!” – Shona Pittaway, Managing Director, Perfect Destinations. Perfect Destinations’ business has grown by 300% in the subsequent 24 months since the implementation of Travelyst. The company would not have been able to manage this growth without the inbuilt customer relationship management in Travelyst, ensuring consistent quality service and timely responses to its customers. 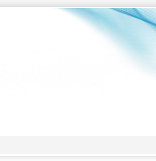 “It’s fast to load quotes and easy to invoice. You can see immediately if a client is loaded on the system.” – Natasha Coetzer, Travel Dreams. 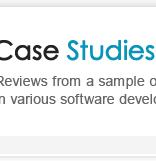 Catalyst BSE, our business systems engine that enables our analysts and developers to create business applications in the shortest possible time, was used as the development platform. All the effort ViaData has spent improving rollout and control processes in Catalyst paid off as the Travelyst application benefits from Catalyst’s very fast and tightly controlled approach to system development and allows for a software package that is truly tailored to each customer’s individual requirements in the shortest time, keeping project budgets low. 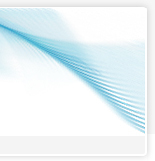 ViaData has been working in the tour operator business since 2009 and we know the travel business very well. Travelyst is currently in use at 3 major tour operators across 10 brands, in South Africa. 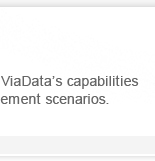 ViaData continually adds new functionality and features to our systems as technology improves and by customer request. 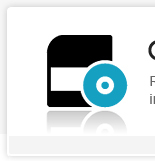 All new features and functionality, no matter which client requests them, are rolled out to all our clients as part of our Service Level Agreement. 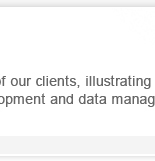 We have much value to offer you in terms of our understanding of data-driven business, business issues, processes, the impact of new systems in business culture and our long pedigree of satisfied clients over a quarter of a century. To find out more, or to arrange a demonstration, please contact us!